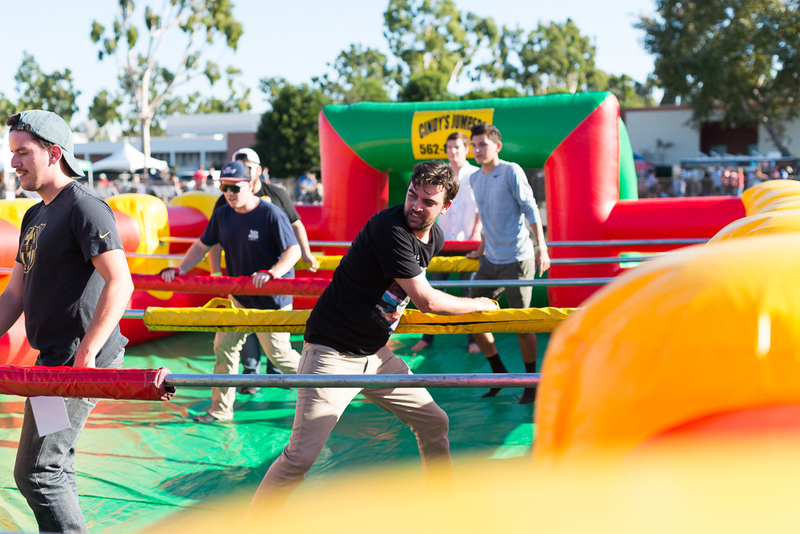 With mini beer mugs in hand and wristbands comfortably secured, off to the track went hundreds of attendees at Cal State Long Beach’s First Annual Craft Beer Festival. Beer enthusiasts had over 50 breweries they could sample from without limits. He pointed around the track, which was lined to capacity on both sides by white tents housing the individual brewery stands. Zeph Varley (left) with friends Matteo D’Orio, (middle) and Daniel Passmore (right). Varley’s friend Daniel Passmore, whom Varley described as “the more serious beer drinker” of the trio, said he liked the event but that it could use some improvement. “The brewery lineup is fairly solid but there’s nothing super rare,” said Passmore. There were a variety of IPAs and pale ales, with most breweries seemingly playing it safe. A notable exception was Palmdale-based Transplants Brewing Company. On tap was one of the brewery’s top sellers Filbert, a hazelnut chocolate brown ale. Another fun option to try was the strawberry blond that Long Beach’s very own Belmont Brewing Company had to offer. For those who wanted a non-alcoholic option or needing a bit of a break between beers, there were also teas, juices and coconut waters to sample. 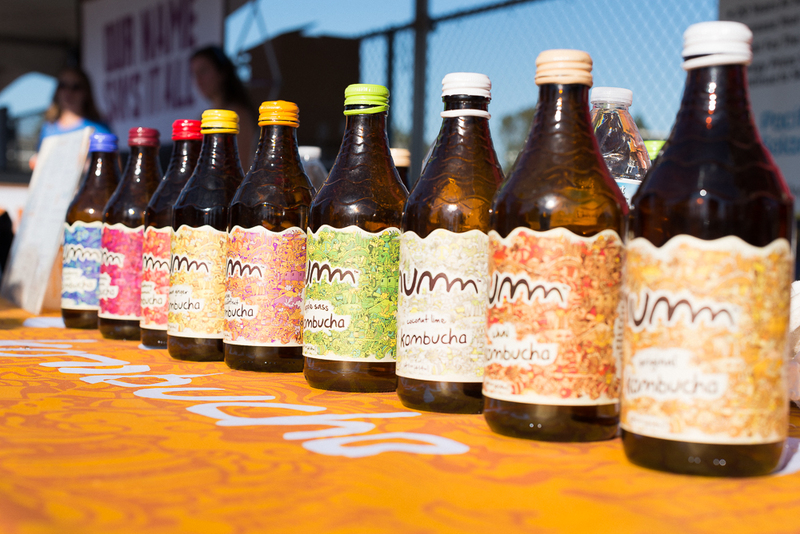 “It’s a great way to sober up,” said one of the workers handing out Kombucha tea samples. Although the event had minimal lines overall, one stand that seemed to have a consistently long one was San Diego-based So Rich! Chocolates, an artisan chocolate company that specializes in beer pairings. Here people could get a chocolate sampling that confectioner Johna Nilson recommended for them based on the beer they currently had in hand. Her most suggested combination was a chili chocolate. That could have been the reason for a Korean food truck, which was also at the event offering hungry attendees the chance to purchase barbecue and rice plates with the option of, you guessed it: spice-packed kimchi. Christina Khong (far left) wears a matching pretzel-and-lifesavers necklace with her friends. One group of friends- all CSULB alumni Master of Social Work graduates- chose to bring their own food to the event instead. They had each made wearable pretzel and gummy lifesavers necklaces. “We’ve been to several beer festivals [together], and they’re a thing,” said Christina Khong, who was jokingly explaining her plans of making the necklaces to sell at the event next year due to their popularity. She said several people had asked where they had purchased the edible necklaces from. For those looking to burn any added calories on spot at the festival, the grassy field was the place to do it. Here there were human foosball and life-size jenga games, as well as the option to dance to the live music that was playing just on the other side of the field.